For when it begins pouring! In our climate, there's no telling when it's going to rain. The morning could start off clear, blue, and without a cloud in sight, but in mere seconds the sky could begin spouting cats and dogs (and rabbits and hamsters, for when the delubyo's especially strong). What's a girl to do when stepping outside could most likely mean the day's second—and unwanted—bath? Below, five tips on working the tricky-yet-totally-en-vogue raincoat. Forget getting drenched; bring on the downpour! Andreea Diaconu clearly knows the power of a timeless black coat, no matter the fabric. This PVC version lends her simple mini skirt, t-shirt, and ballet flats combo a devil-may-care Parisienne vibe. Gloomy weather is the perfect excuse to layer, something Eva Chen seems to know by heart. 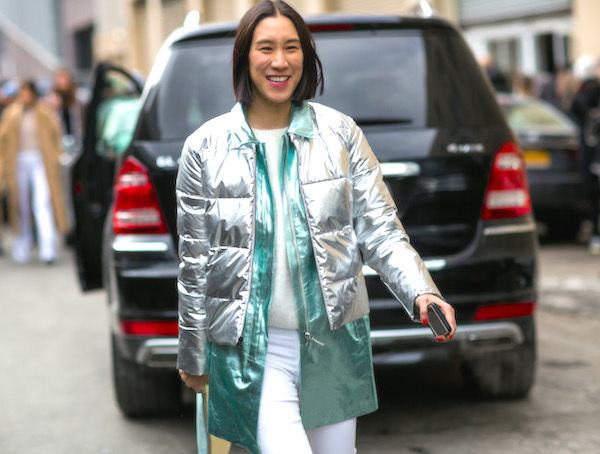 Tossing a silver puffer jacket over a green raincoat is one chic way to protect an icy white ensemble (wear at your own risk!). If bright yellow raincoats were a fixture in your childhood, give them a grownup twist a la Selena Gomez via a floor-dusting longline silhouette. Team with a white tank, cropped jeans, and classic pumps. Fresh! Yes, even your rain gear can be prim and proper! Susie Lau proves us right, two birds with one stone: an ultra-sweet sherbet pink shade plus that dainty tea length make for a demure take on weatherproofing.